Charles II of Spain (Spanish: Carlos II; 6 November 1661 – 1 November 1700) was the last Habsburg ruler of Spain. His realm included Southern Netherlands and Spain's overseas empire, stretching from the Americas to the Spanish East Indies. Known as "the Bewitched" (Spanish: el Hechizado), he is noted for his extensive physical, intellectual, and emotional disabilities and his consequent ineffectual rule. He died in 1700, childless and heirless, with all potential Habsburg successors having predeceased him. In his will, Charles named as his successor his 16-year-old grand-nephew, Philip, Duke of Anjou, grandson of Charles' half-sister Maria Theresa of Spain, the first wife of Louis XIV (and thus grandson of the reigning French king Louis XIV). Because the other European powers viewed the prospective dynastic relationship between France and Spain as disturbing the balance of power in Europe, the War of the Spanish Succession ensued shortly after his death. Charles was born in the Spanish capital, Madrid, the son of Philip IV of Spain and his second wife, Mariana of Austria (also known as Maria Anna). As the only surviving male heir of his father's two marriages, Charles was named Prince of Asturias, the title given to the person first in line to the Spanish throne. The only vigorous activity in which Charles is known to have participated was shooting. He occasionally indulged in the sport in the preserves of El Escorial. The years of Charles's reign were difficult for Spain. The economy was stagnant, there was hunger in the land, and the power of the monarchy over the various Spanish provinces was extremely weak. Spain’s finances were perpetually in crisis. Charles' unfitness for rule meant he was often ignored, and power during his reign became the subject of court intrigues and foreign influence, particularly French and Austrian. 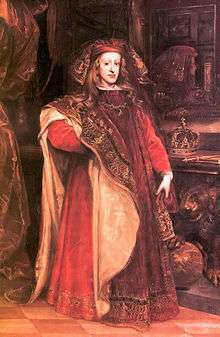 Charles was three years old when his father, Philip IV, died on 17 September 1665. 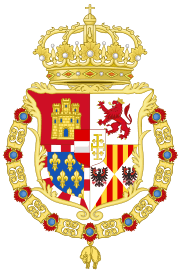 The Council of Castile (as the Regency Council) appointed Philip's second wife and Charles' mother, Mariana of Austria, regent for the minor king. At the time, the land area of the Spanish Empire was 12.2 million square kilometers (4.7 million square miles), but in other respects it was in decline, contributed to by Philip's inability to achieve successful domestic and military reform. 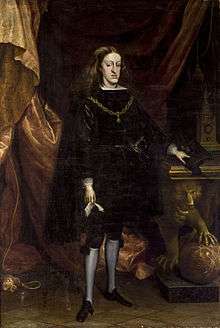 Charles inherited the Portuguese Restoration War and soon after his accession Spain was plunged into the War of Devolution with France in Spanish Netherlands. As regent, Mariana managed the country's affairs through a series of favourites ("validos"), whose merits usually amounted to no more than meeting her fancy. 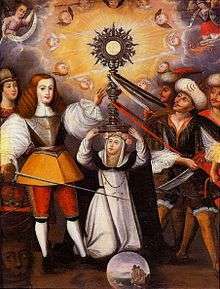 Her validos included her confessor, Juan Everardo Nithard, whom she made Grand Inquisitor in 1666, and which gave him access to the Regency Council, from where he became the most important person of the Spanish Court. From then on he was the de facto prime minister or valido of Spain. The sheer size of the kingdom at that time made this kind of government increasingly damaging to the realm's affairs. By 1668, Nithard was desperate to reduce Spain's military commitments at almost any price, and to end the Portuguese Restoration War; so he accepted the loss of the Crown of Portugal and formally recognized the sovereignty of the House of Braganza by signing the Treaty of Lisbon. The treaty ceded the North African enclave of Ceuta to Spain, but marked the loss of Portugal and the Portuguese colonies. To end the War of Devolution, Nithard signed the Treaty of Aix-la-Chapelle (1668). However, the members of the Councils and in particular Charles' illegitimate half-brother, the popular military commander Juan José, started intriguing to overthrow the queen-regent's favorite. In February 1669, a military revolt in Aragon and Catalonia led by Juan José, who then proceeded to march toward Madrid, brought about Nithard's dismissal. From 1671, the queen-regent's then favourite was Fernando de Valenzuela. In 1675, a court intrigue conducted by Valenzuela's rivals and supported by Juan José succeeded in driving Valenzuela from court. Also in 1675, Charles reached the age of 14, the age when he was legally entitled to rule without a regent. However, on the basis of Charles' illnesses and disabilities, Mariana decided to continue the regency. Valenzuela returned to court and in 1677 the queen-regent appointed him prime minister, and conferred a grandeeship on him, to the profound indignation of the other grandees. In January 1678, a palace coup broke out against the queen-regent, and Don Juan José established himself as prime minister. Mariana was driven from Madrid, and Valenzuela was exiled. By the Treaties of Nijmegen (1678), which brought to an end the Franco-Dutch War (1672–78), Spain ceded to France the Imperial County of Burgundy (Franche-Comté), and further territories of the Spanish Netherlands, including the town of Saint-Omer with the remaining northwestern part of the former Imperial County of Artois, the lands of Cassel, Aire and Ypres in southwestern Flanders, the Bishopric of Cambrai, as well as the towns of Valenciennes and Maubeuge in the southern County of Hainaut. Great hopes were entertained for his administration, but it proved disappointing and short. Most nobles were incompetent and self-serving, but there were a few good men such as the Count of Oropesa, who managed (despite ruinous deflation) to stabilize the currency. Others tried to weaken the power of the Inquisition (which however was not abolished until 1808) and encourage economic development. It was imperative for Charles to produce an heir as early as possible, and Don Juan arranged to find a suitable wife for him in the person of Marie Louise of Orléans. A proxy marriage ceremony took place in Paris on 30 August 1679. Don Juan José died on 17 September 1679, and the queen-regent returned to court but from then on, the main influence over the affairs of Spain were to be the king's two consecutive wives, in particular the second one, the forceful Mariana of Neuburg. On 19 November 1679, at the age of 18, Charles married 17-year-old Marie Louise in person in Spain. In 1680, Charles presided over the greatest auto-da-fé in the history of the Spanish Inquisition, in which 120 prisoners were forced to participate, of whom 21 were later burned at the stake. A large, richly adorned book was published celebrating the event. The last public auto-da-fé took place in 1691. Toward the end of his life, August 1700, in one of his few independent acts as king, Charles created a Junta Magna (Great Council) to examine and investigate the Spanish Inquisition. The council's report was so damning of the Inquisition that the Inquisitor General convinced the decrepit monarch to "consign the 'terrible indictment' to the flames". When Philip V took the throne, he called for the report, but no copy could be found. In November 1683, Louis XIV of France again attacked the Spanish Netherlands in the War of the Reunions (1683–84). Though brief, the war was devastating on Spanish forces and ended in August 1684 in the Truce of Ratisbon, to enable the Holy Roman Emperor to concentrate on the attacks from the Ottoman Empire in the east in the Great Turkish War. France attacked the Spanish Netherlands again in 1688 at the start of the Nine Years' War which ended with the Treaty of Ryswick in 1697, and Spanish recovery of Catalonia, and the barrier fortresses of Mons, Luxembourg and Kortrijk, territories occupied by France since the start of hostilities. In February 1689, Marie Louise of Orléans, the king's first wife, suddenly fell gravely ill and died under dubious circumstances. Her death has been attributed to one or more of the following suspected causes: injuries sustained while horseback riding, appendicitis, and deliberate assassination by poisoning (at the supposed direction of her mother-in-law, and allegedly in response to the couple's continuing failure to produce an heir). In August 1689, Maria Anna of Neuburg became the second wife of Charles II (from 1689, marriage by proxy [1690 marriage in person]), until his death (just 10 years later). Though brief, the marriage and Mariana's influence would significantly and destructively impact the Spanish court. This marriage, like the first, also produced no pregnancies nor any heir. After his mother, Mariana of Austria, died on 16 May 1696, Charles ruled without a regent until his death in 1700. Toward the end of his life Charles' fragile health deteriorated and he became increasingly hypersensitive and strange, at one point demanding that the bodies of his family be exhumed so he could look upon the corpses. He officially retired when he had a nervous breakdown caused by the amount of pressure put on him to try to pull Spain out of the economic trouble it was going through. He lived a simple life from then on, playing games and other activities. He died in Madrid on 1 November 1700, five days before his 39th birthday. The physician who practiced his autopsy stated that his body "did not contain a single drop of blood; his heart was the size of a peppercorn; his lungs corroded; his intestines rotten and gangrenous; he had a single testicle, black as coal, and his head was full of water." American historians Will and Ariel Durant described Charles II as "short, lame, epileptic, senile, and completely bald before 35, he was always on the verge of death, but repeatedly baffled Christendom by continuing to live." Spanish gold coin minted in 1700, the last year of the reign of Charles II. During the reign of Charles II, Spanish power and prestige declined at an accelerated pace, that started in the last years of Count-Duke of Olivares' prime ministership in the 1640s. The economy, on the whole, was depressed between 1650 and 1700, with low productivity, famines, and epidemics. Spain's economy (especially in Castile) crumbled. This was partially due to plague outbreaks, for example during 1676–1685, and partially due to the huge casualties caused by almost continuous warfare. The period 1677–1686 was the lowest point; there was famine, natural disasters, and economic chaos. Emigration to the New World increased; with the population of Spain decreasing by nearly two million people during the 17th century: nearly 1.25 million from plagues, and 300,000 from the expulsion of the Moriscos. Spanish territory shrank with the loss to France of some territories in the Spanish Netherlands. The city of Charleroi in Belgium was named after him. It was founded in 1666 during his reign as Count of Namur or generally sovereign of the Spanish Netherlands. The Caroline Islands were named for him by Francisco Lazcano. Charles II defending the Eucharist against the Moors. Charles was born in Madrid in 1661 a son of King Philip IV of Spain with his second wife, Mariana of Austria. By the time of Philip's death Charles was his only surviving legitimate son and heir. 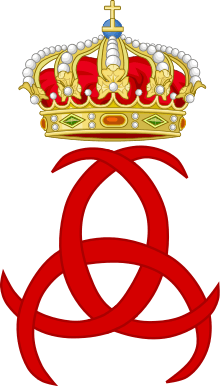 By the time of Charles's birth there had been many generations of inbreeding within the Spanish royal house; his physical and mental disabilities are widely attributed to this inbreeding. The practice of first-cousin and uncle-niece marriages was common among 17th-century European nobility, intended to preserve prosperous families' properties. The Habsburgs were an extreme case of this; they had won their extensive holdings mostly through marriages and were determined to keep others from turning the tables on them. Charles's own immediate pedigree was almost exclusively populated with close relative relationships: Charles's mother, Mariana of Austria, herself a Habsburg, was a niece of his father, Philip. Mariana was a daughter of Empress Maria Anna of Spain (1606–46) and Emperor Ferdinand III. Thus Maria Anna was simultaneously his aunt and grandmother while Margaret of Austria, Maria Anna's mother, was both his grandmother and great-grandmother. The inbreeding was so widespread in his case that all of his eight great-grandparents were descendants of Joanna and Philip I of Castile. This inbreeding had given many in the family hereditary weaknesses that a Habsburg generation was more prone to still-births than were peasants in Spanish villages. There was also mental illness in Charles's family. His ancestor, Queen Joanna, became insane early in life and became known as "Joanna the Mad." Dating to approximately the year 1550, outbreeding in Charles II's lineage had ceased (see also pedigree collapse). 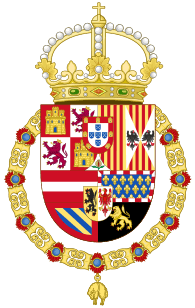 From then on, all his ancestors were in one way or another descendants of Joanna and Philip I of Castile, and among these just the royal houses of Spain, Austria and Bavaria. Charles II's genome was actually more homozygous than that of a child whose parents are siblings. He was born physically and mentally disabled, and disfigured. Possibly through affliction with mandibular prognathism, he was barely able to chew. His tongue was so large that his speech could barely be understood, and he frequently drooled. It has been suggested that he suffered from the endocrine disease acromegaly, or his inbred lineage may have led to a combination of rare genetic disorders such as combined pituitary hormone deficiency and distal renal tubular acidosis. In 1679, the 18-year-old Charles II was married to 17-year-old Marie Louise of Orléans (1662–1689), eldest daughter of Philippe I, Duke of Orléans (the only sibling of Louis XIV) and his first wife Princess Henrietta of England. At that time, Marie Louise was known as a lovely young woman. It is likely that Charles was impotent, and no children were born. Marie Louise became deeply depressed and died at 27, ten years after their marriage, leaving the 28-year-old Charles heartbroken. Still in desperate need of a male heir, the next year he married the 23-year-old Palatine princess Maria Anna of Neuburg, a daughter of Philip William, Elector Palatine, and sister-in-law of his uncle Leopold I, Holy Roman Emperor. However, this marriage was no more successful than the first in producing the much-desired heir. 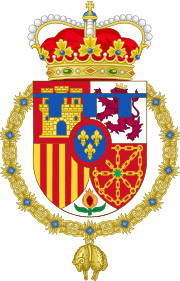 As the Crown of Spain passed according to cognatic primogeniture, it was possible for a woman, or the descendant of a woman, to inherit the crown. 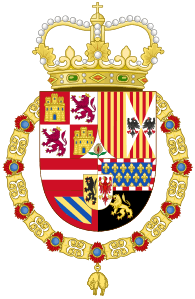 When it became clear that Charles would have no children of his own, plans were initially drawn up to designate the daughter and grandson of his sister Margaret Theresa as heirs (whilst Margaret Theresa's line did not have the best claim to the throne, their inheritance would ensure Spain remained independent of both France and Austria). This line of descent, however, failed in 1699 at the death of Joseph Ferdinand, Prince of Asturias, aged six. By the time of Charles II's death, then, the only other surviving legitimate descendants of his father Philip IV were the family of Philip's eldest daughter Maria Theresa of Spain (who had herself died in 1683), the first wife of the reigning Bourbon king of France Louis XIV. In his will, Charles named as his successor his 16-year old grand-nephew, Philip, Duke of Anjou grandson of Charles' half-sister Maria Theresa of Spain, the first wife of Louis XIV. 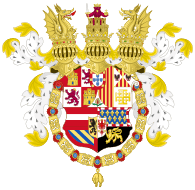 Upon any possible refusal, the crown of Spain would be offered next to Philip's younger brother, Charles, Duke of Berry, then to the Archduke Charles of Austria, who in 1711 became Holy Roman Emperor Charles VI. The French genealogical line had the better claim to the Spanish throne than did the Austrian. The French line is traced through Maria Theresa (1638–1683), who was older than the Austrian line traced through her half-sister Margaret Theresa (1651–1673). Of the French line, Maria Theresa had died in 1683 and her eldest son, Louis, Grand Dauphin (also the son of Louis XIV), would have had the next claim. However, the Grand Dauphin was passed over as he was at the time the heir apparent to the French throne (although in the event he predeceased his father the King). 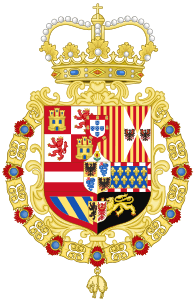 The next best genealogical claimant to the Spanish throne, the Grand Dauphin's son Louis, Duke of Burgundy, was passed over for the same reason, leaving the Grand Dauphin's second son Philip, Duke of Anjou, as the leading claimant. However, the Austrian branch (i.e., the Archduke Charles of Austria) claimed that Maria Theresa had renounced the Spanish throne for herself and her descendants as part of her marriage contract with Louis XIV. (See Treaty of the Pyrenees) A similar objection would apply to Philip's brother Charles, Duke of Berry and to the Grand Dauphin. This was countered by the French branch's claim that the renunciation was on the basis of a dowry that had never been paid. When Charles II died in 1700, the line of the Spanish Habsburgs died with him. His successor, as named in his will, was Philip, Duke of Anjou. At a Royal Council meeting in France, it was agreed that Philip would accept the Spanish throne, but would forever renounce his claim to the throne of France for himself and his descendants. The spectre of the multi-continental empire of Spain passing under the effective control of Louis XIV, who in the latter 17th century had taken an aggressive position in Europe, provoked a wide coalition of powers which opposed Philip's succession. In an attempt to allay their concerns of a possible union of the two crowns, in February 1701, Louis XIV caused the French Parlement (a court) to register a decree that should Louis, Grand Dauphin (King Louis's eldest son, and Philip's father) himself have no heir, other than Philip, then the Duke of Anjou would surrender the Spanish throne for that of the French, to ensure dynastic continuity in France but ensure the non-unity of the two powers. Other European powers, such as the English, the Dutch and the Austrians, were not satisfied with Louis' assurances and ploys, especially after he, pursuant to a treaty with Spain, occupied several towns in the Spanish Netherlands (modern Belgium and Nord-Pas-de-Calais). This was the spark that ignited the powder keg created by the unresolved issues of the War of the League of Augsburg (1688–97). Almost immediately the War of the Spanish Succession (1701–1714) began. After thirteen years of bloody, global warfare, fought on four continents and three oceans, the Duke of Anjou, as Philip V of Spain, was confirmed as King of Spain but the newly formed United Kingdom of Great Britain was to control the sea lanes in the Mediterranean and the Atlantic through its possessions in, for example, Gibraltar and Minorca. A proviso of the peace perpetually forbade the union of the Spanish and French thrones. 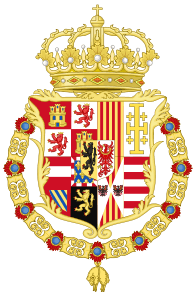 The House of Bourbon, founded by Philip V, has intermittently occupied the Spanish throne ever since. A Bourbon sits today on the throne of Spain: Felipe VI (2014–present). 1 2 "A History of Spain and Portugal, v. 1". Chapter 15, "The Seventeenth Century Decline". pp. Payne, Stanley. Retrieved July 7, 2013. ↑ Sampedro, José Luis (2006). "Los títulos del Príncipe - La dignidad de Príncipe de Asturias". Boda Real. abc.es. Retrieved July 8, 2013. ↑ Celballos, F C & G Álvarez. (2013). Royal Dynasties as Human Inbreeding Laboratories: The Habsburgs. Heredity, [online] Volume 111, pp. 114-121. doi: 10.1038/hdy.2013.25. ↑ Callaway, E. (2013). Inbred Royals Show Traces of Natural Selection. Nature News, [online] Available at: http://www.nature.com/news/inbred-royals-show-traces-of-natural-selection-1.12837 [Accessed 7 July 2016]. 1 2 3 4 5 6 7 Gonzalo Alvarez; Francisco C. Ceballos; Celsa Quinteiro (15 April 2009). "The Role of Inbreeding in the Extinction of a European Royal Dynasty". PLoS ONE. 4 (4): e5174. doi:10.1371/journal.pone.0005174. PMC 2664480 . PMID 19367331. Retrieved 16 September 2013. ↑ Jon Cowans (2003). Modern Spain: A Documentary History. U. of Pennsylvania Press. pp. 26–27. ISBN 0-8122-1846-9. ↑ "Treaty Of Ryswick". Encyclopædia Britannica 1911. Retrieved 2012-03-08. .
1 2 Will of Charles II (in Spanish). ↑ Durant, Will. "The Age of Louis XIV", p.699. Simon and Schuster, New York, 1963. Wikimedia Commons has media related to Charles II of Spain.